After posting some of the performance specs for the Rally Fighter the other day, the team decided to post a few "specs" on the build of LM vehicles in order to bring the details mentioned over several posts to one place. Local Motors has set a course to build efficient vehicles in a sustainable manner. Though Jay, Ari and I have all touched on different efficiency features, specifically for the Rally Fighter, we thought it time to describe our overall intent. Lightweight: Lighter vehicles require less energy, and therefore less fuel, to move. By using materials such as carbon fiber and thermoplastics, Local Motors is able to build cars of superior safety and strength without the extra weight of traditional materials, like steel. Vinyl Coating, not Paint: Paints are generally hard on the environment. While some more eco-friendly paints are available, they are very expensive. Plus, a typical paint job can add 100-150 pounds of weight to your vehicle. So, we are not painting Local Motors vehicles. We will wrap in vinyl. Vinyl wrapping has multiple benefits. Among them: price, weight, flexibility, end of life recycling. Your vinyl wrap will cost less than a typical paint job and weigh less. 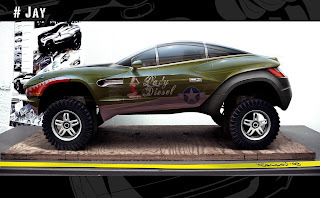 And now, with the Local Motors community, you will be able to custom design your Rally Fighter (and soon, other Local Motors vehicles) vinyl wrap to your unique desires. Plus, when you tire of your vinyl wrap design it can be removed and recycled; you can’t do that with paint. Build it JIT, and Make it Simple: JIT, or Just-In-Time, build processes reduce waste as compared to other manufacturing models. Local Motors will not build 1,000 Rally Fighters that will then bake in the Southwestern sun as they hope for a buyer. Rather, each Rally Fighter build will be an experience and part of the purchase. By building JIT, we will allow ourselves some agility. If we find a feature that needs adjustment, we are able to do so – without recalling 1,000 vehicles. Allowing this agility will reduce waste and increase efficiency. We are keeping it simple. Rally Fighters and every Local Motors vehicle are built with your input, and therefore feature “everything you want, and nothing you don’t”. All of the gadgets and add-ons in today’s cars add an extraordinary amount of weight, which increases fuel usage. In addition to the extra weight, by the time many of these built-in components, like GPS , make it to market they are outdated. So why include it? Instead, we will design your Rally Fighter to incorporate your existing and desired technology – like your iPhone, or your personal choice of GPS etc. Build it Locally: Local Motors is the ultimate experience for a car enthusiast. Cars built and designed for you, for your local area, and with your input and collaboration. It doesn’t get more personal or exciting than that. What some people don’t realize is that our choice to build cars in regional Micro-Factories is also very sustainable. Local Motors is able to adapt and incorporate the most efficient fuel choices and powertrains per region. This could mean electric powertrains for Hawaii and Manhattan, CNG (compressed natural gas) for Texas, and hydrogen for California. Because we are small, decentralized, and build JIT, we are able to help you build cars that make sense for you and for your local area. With Local Motors, you are working with a community of talented car designers to develop the cars you want. As result, you know that every car built in a Local Motors Micro-Factory will not only be “most efficient per class” but “hottest in class” and “best designed in class” as well.